The debate over the competition's No.1 ruckman will be fast-tracked to February as Brodie Grundy and Max Gawn prepare to face off in a scratch match at the Holden Centre. 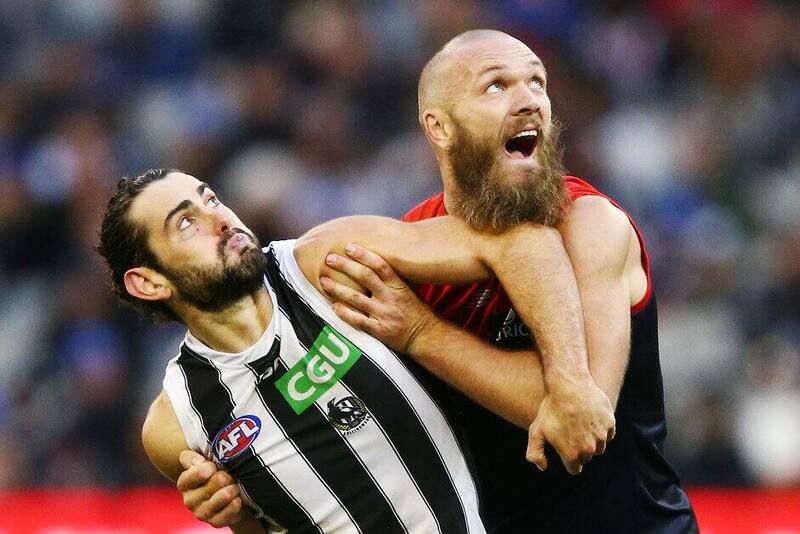 Pending Grundy's return to full training following a toe complaint, the 2018 All Australian ruckmen will meet when Collingwood hosts Melbourne on the morning of Friday, February 22. The clash follows Geelong's decision to play North Melbourne in Torquay on the same day and Hawthorn's trip to take on Carlton at IKON Park on February 21. Magpies coach Nathan Buckley will be without Scott Pendlebury, Steele Sidebottom, Travis Varcoe and Jaidyn Stephenson, who have been selected to play AFLX later on Friday night at Marvel Stadium. While Simon Goodwin loses Steven May and Tom McDonald to the one-night event, decisions will need to be made on Jack Viney (foot), Jake Melksham and Nathan Jones (hamstrings) and Clayton Oliver (shoulders). Collingwood defenders Lynden Dunn and Matt Scharenberg and Demons star Jake Lever aren't expected to take part as they recover from ACL reconstructions. With both coaches experiencing their shortest pre-seasons in their respective tenures due to longer 2018 campaigns, Buckley expects an intense hitout against the Demons. "I don't know what other coaches' opinions of intraclubs are, but we play against each other enough in training, when you get to an internal, it's a mess," Buckley told AFL.com.au. "When you move the ball well your defence is poor, then when you defend well your offence is poor. I find it harder to educate in a full-blown internal game. "The practice game will be good for us and I believe it will be a fairly decent hitout, clearly the first one is always a good blowout." The Pies will then travel to WA to face Fremantle in the opening round of the JLT Community Series on Monday, March 4 before facing Carlton in Morwell on March 11. Just 11 days later, the Pies will face Geelong at the MCG to kickstart their season before big tests against Richmond and a Grand Final rematch against West Coast. "You don't go into round one with your players underdone, the guys who play round one will be our fittest and generally be the guys who have executed the right amount of pre-season," Buckley said. "We're in decent shape in regards to the number of injuries and we know we've got a pretty solid couple of games to start the season off so we'll get some immediate feedback on how our pre-season has gone. "It's going to be an interesting little build-up for us in the next couple of months." The Pies and Demons will meet twice in 2019 – in rounds 12 and 21 – after just one match in 2018, a 42-point win for the Pies on Queen's Birthday. On that day Gawn, who assumed the No.1 mantle in the All Australian side, collected 33 hitouts, 17 disposals and a goal against Grundy's 38 hitouts and 13 touches.